All you need to do is insert a popsicle stick horizontally (not sticking straight up) in the cookie dough, pointing towards the middle of the cookie. Arrange them on a pan like normal, except try to keep the cookies and sticks from touching each other. Bake the cookies by the directions of their regular recipe. While they're baking, the sticks shouldn't burn in the oven, but it's probably a good idea to check on them now and then anyways. The decorating is the fun part. This is where you can be creative. All you need is some vanilla frosting and your favorite color food dye. 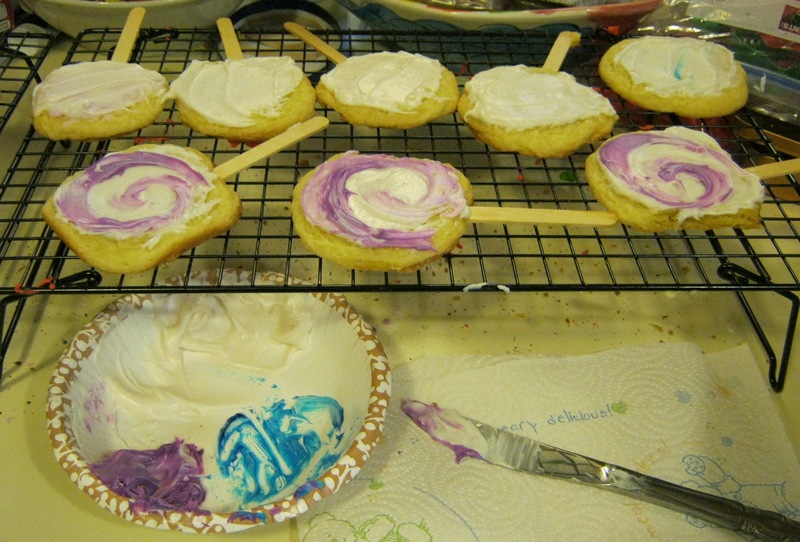 I was lazy and just used a butter knife and a paper plate to mix and decorate my cookies. I finished them off by putting some colorful sprinkles on top. You can use just about any edible topping as an embellishment to your cookie. The options are endless.. you can use granulated sugar sprinkles, m&m's, chocolate chips, or even jelly beans. It's up for you to decide. By the way these, were a hit at all the family get-together's this year. I think people enjoyed the creative twist on such a holiday classic. It's such a simple thing to do, there's no reason you shouldn't give it a try one day! These would be perfect for events besides Christmas. Give them out at kid's parties or as birthday presents. They'd probably sell out at bake sales if packaged nicely. My mom helped me set up this impromptu Christmas scene featuring Santa towels and our awesome cookie pops.